The power to bring people together at critical moments can significantly enhance your ability to succeed. Collaboration is central to solving problems, innovating, and making your organization more competitive. 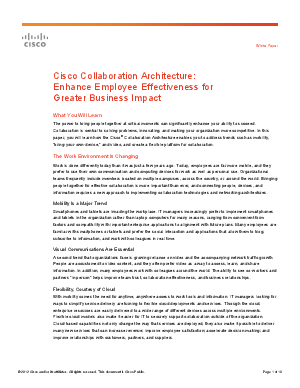 In this paper, you will learn how the Cisco® Collaboration Architecture enables you to address trends such as mobility, “bring-your-own-device,” and video, and create a flexible platform for collaboration.